December 16, 2016 December 16, 2016 Dr. R. A. 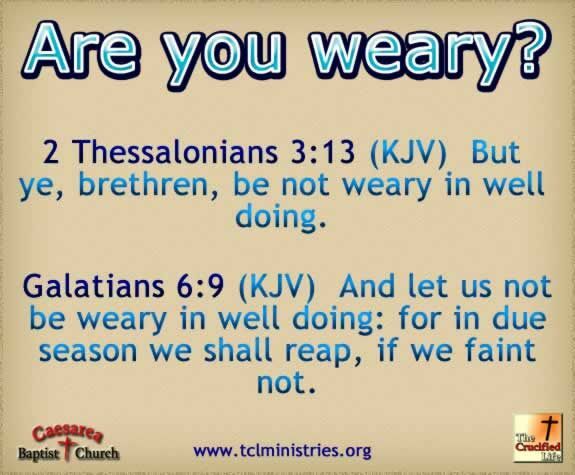 2 Thessalonians 3:13 (KJV) But ye, brethren, be not weary in well doing. Often when performing a task over a period of time, the zeal that we had at the onset evaporates. Many factors can contribute to the dissolution of this zeal, such as monotony, fatigue, familiarity, the need for appreciation and acceptance, discouragement, weariness, etc. Whatever the reason for the loss of passion, the fact still remains that what we once found pleasure in doing is seen as a mountainous chore. It is easy to think losing fervor only happens in our personal life but unfortunately, it is an epidemic that occurs in our jobs, family, relationships, education and even spiritually. Yes, Spiritually. So often especially in recent times, we hear of pastors committing suicide, members leaving the church and just walking away from their faith in God. This occurs because they have lost their zeal and became weary in well doing. From a religious perspective, we may want to deny that serving God at times can result in persons becoming weary. We may even dare to say that if it does occur then, there is something wrong with that individual. The pointing of fingers is not important; however, the crux of the matter is that weariness occurs and has the ability to have a grave impact on the individual. The Bible admonishes that we should not be weary in well doing. I believe that if the possibility for this did not exist, then it would have not been addressed in the word of God. But because it does, the word lets us know that we should not allow ourselves to slack off, be discouraged or become tired or worn out when doing what is right. Instead, we should be determined and consistently push to do what is right. Do what is right when we are being recognized and when we are being overlooked. Do what it right when we are being ostracized and when we are being included. We should do what is right in and out of season because we will reap if we faint not. We should not Quit. We should not Faint. Rather, we should press beyond our limits and do what is right. The season of fatigue, discouragement, weariness, etc. will pass. How I know this? Because nature teaches us that seasons change. Change is the beauty of seasons. The season that you are in may last a while, but there is an appointed time for its end. Change is coming, and we should ensure that we are able to reap a bountiful harvest of goodness because we did not allow weariness to dictate. Continue to sow seeds of goodness, faith, love, meekness, temperance, long-suffering, joy, peace, and gentleness. Be not weary in well doing. Next postDo Not Quit! Do Not Faint!